This cat burglar will steal all the style and atmosphere that isn’t nailed down. Narrative does not interest her so much, but it hardly matters. Prepare to get your Irma Vep on with Alice Waddington’s short film Disco Inferno (trailer here), which screens during the 2016 Slamdance Film Festival. A woman in a skin tight body suit slinks into a mansion that vaguely brings to mind Last Year at Marienbad. As she skulks about some pagan rituals appears to be underway. It is a scene not unlike Eyes Wide Shut, but with more goat heads. Any and all cinematic allusions we might suspect are probably intentional. After all, Waddington (somewhat sheepishly) dedicates the film to Georges Franju. 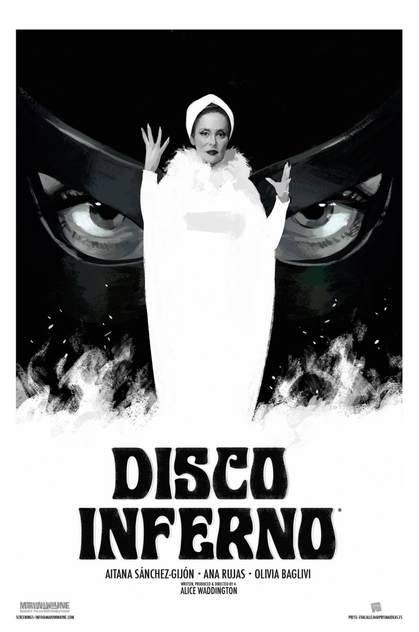 Initially, Disco Inferno looks like a stylistic mash-up of Bruce Weber and Louis Feuillade until it takes an overtly and explicitly satanic turn. It seems the grand dame of the ball is Satan herself and the Vepish figure is a responsible minion come to drag her back to her sulfuric duties. Then it gets weird. Does Disco make sense? Sure, kind of. More importantly, it looks fabulous and when it crescendos, it gets unsettlingly creepy (before totally letting us off the hook). Waddington serves as her own costumer and she certainly gets her money’s worth. Everything about the film looks rich, particularly Antonio J. García’s lush, fashion-influenced black-and-white cinematography. While not a thespy sort of film, Ana Rujas shimmies quite effectively as the cat-suit woman. Regardless, it is more of a showcase for Waddington’s chops and the talent of her design team. If you want a quick WTF, it hits the spot. Worthy of mention for its sleek, ultra-chicness, Disco Inferno screens again this Tuesday (1/26) as part of the Anarchy Shorts Program at this year’s Slamdance.